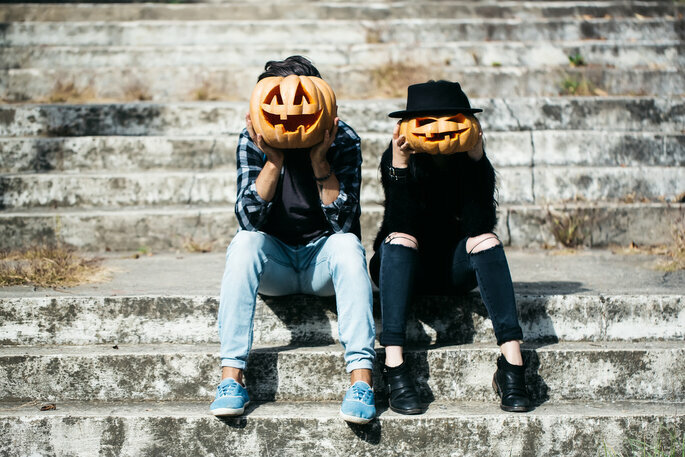 Celebrating Halloween with your partner? 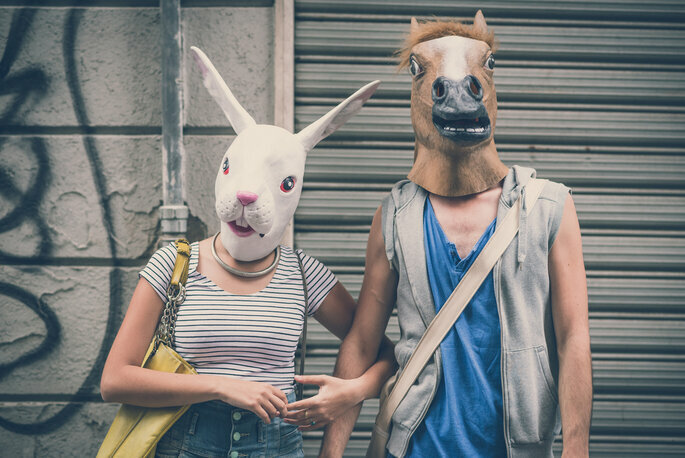 Consider dressing up as a couple to really make a statement this year. Coordinate your costumes for double the scare factor! Although we love smartphones, social media and motorised vehicles, we’ve all fantasised at one time or another about living in another century. Perhaps in a British mansion hidden behind the mist, à la Jane Eyre. Feel like the masters of one of these big houses from the Gothic and Victorian periods. For the men, nothing like a good hat, a long jacket with tails, a scarf and hair brushed back. For the women, black or grey can-can-style dresses, corsets, opulent jewellery and a veil. Both complete with white face makeup, dark eyes and a sombre, sullen expression. 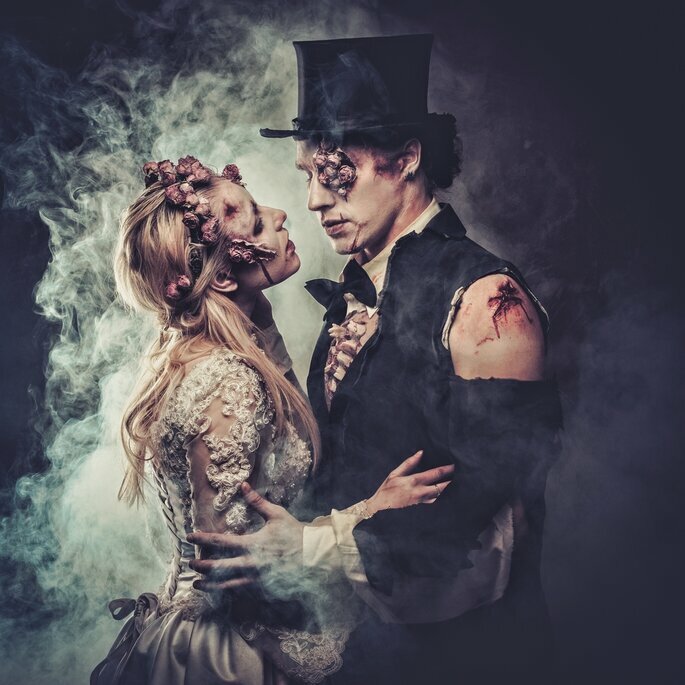 A very romantic way to dress up because there are love stories that survive even after death. 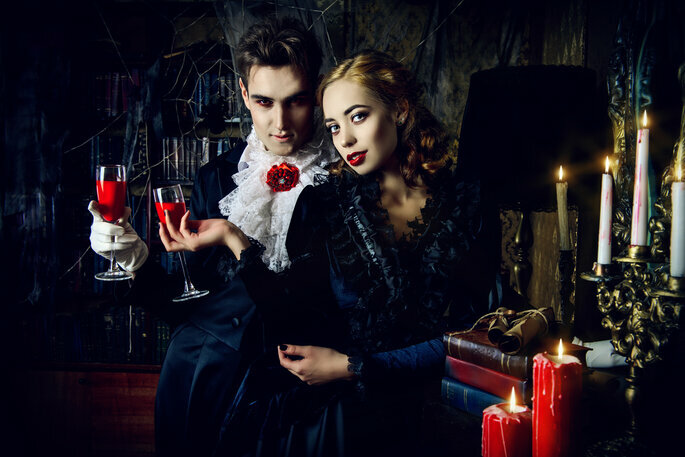 If you opt for this costume, don some brilliant fangs and dress like the gentlemen and elegant ladies of the Middle Ages. Your black capes can be combined with dresses and suits where the red plays a certain role. In the case of boys, frilly white shirts with puffed sleeves, jackets with classic prints and decorative neck accessories are also important. The girls stand out in red dresses with lace sleeves and fishnets. Note: be very careful with garlic, stakes and holy water. And don’t stray too far from your coffins. 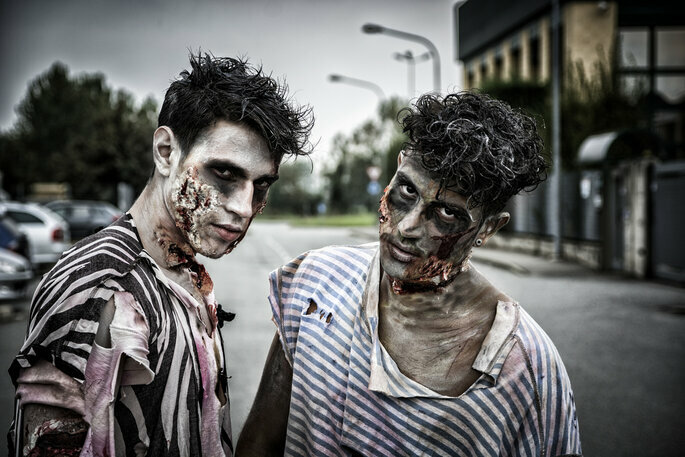 Each year there are more and more stiff-legged zombies wandering the streets on Halloween. This costume is laborious, but the results can be spectacular. Use latex and paint to decorate your face and give it a look of decay (there are loads of tutorials on Youtube). If you like challenges, experiences and the idea of having one of your eyes dislodged from its socket, you will surely find a tutorial to suit you. After that the outfit is simple: just look for destroyed, old clothes. Decorate them with fake blood to simulate the remains of a human flesh feast. But above all, have fun! As a couple this costume is much more fun. Clowns can be fun as long as you have not seen the film “It”. However, some people cause real panic, and quite rightly so. Clowns and even the circus in every aspect, can be terrifying. From Harlequins to jokers, to the run-of-the-mill clown, it’s possible that at least one of them has visited you in one of your nightmares. 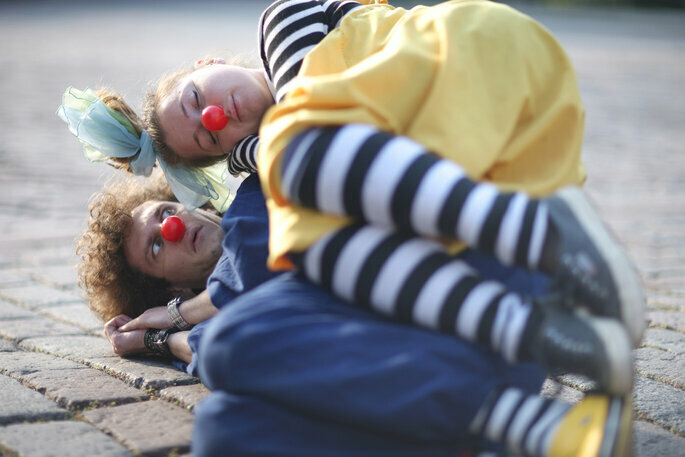 If each member of the couple opts for a different kind of clown it’ll be more interesting (or disturbing, depending on how you look). Try adding something macabre, blood or sharp instruments as props. Experiment with all the possibilities that this costume allows, both in clothes and makeup and accessories. If you go down the street it’s safe to say that no child you come across will ever visit the circus again. Plain and simple. Don’t dress up as zombies, but the spirits that often hang around the cemeteries we know. Have one in mind? Great! Copy their movements, paint your face white, paint some sickly dark circles and let down your hair. Walk with sadness and wear whichever clothes you want, as long as they were in style years ago. That way you’ll represent someone who died long ago, which is much scarier and more realistic. From Zankyou, we want to appeal to everyday terror: mummies, scarecrows, witches and werewolves. Some of these costumes are simple and always successful. 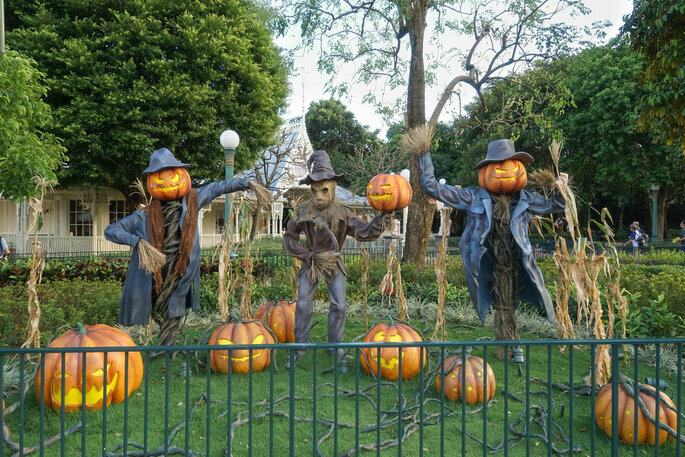 In addition, we think they are the true spirit of Halloween along with haunted houses, creaky floorboards, fog and skeletons. Everyone will recognise you and you will not have to give a master class on the subject to explain. As a couple, you can combine and explore various forms of classic horror. 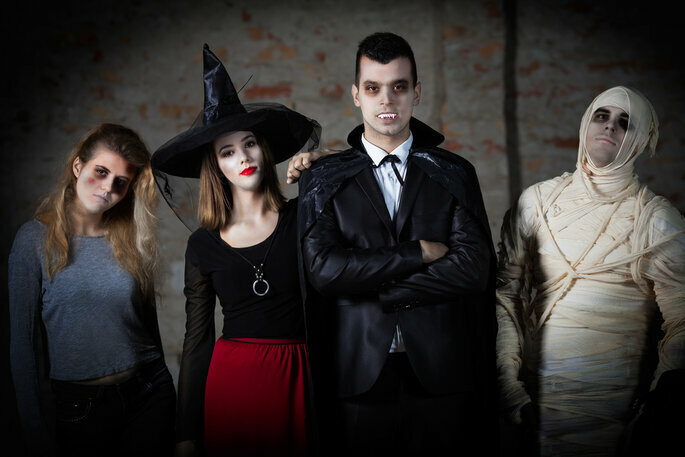 Although the main subject of Halloween should be terror, even in the United States where this holiday originated, the dress code is respected. So, anything goes, but at Zankyou we suggest that the disturbing aspect is respected. It’s Halloween! There will be time for Carnival. 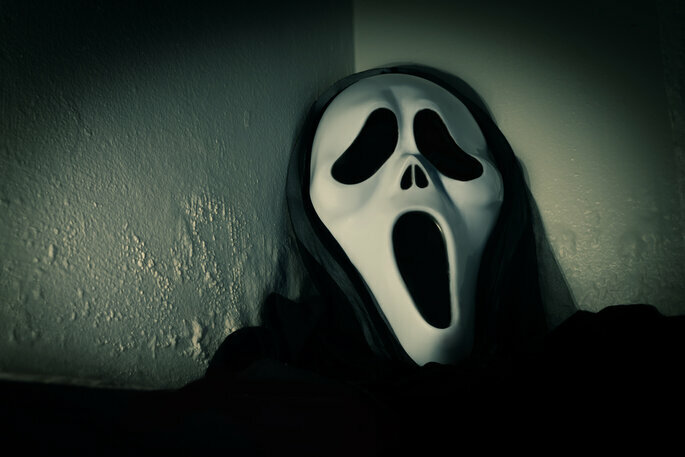 So, use your imagination and try interesting, fear-inducing costumes but stay away from the typical, predictable ones. Takes note of these ideas and mould them as you wish. There’s nothing like imagination and creativity to leave your friends discombobulated by your costume. Try to have fun and release your scary side, always with a touch of humor. Happy Halloween! Proposing is no easy feat, but finding the perfect ring that fits? Sometimes that's even harder! Read on to discover some clever tips on how to size your partner without letting her know what you're up to! Discover the names and meanings of every anniversary year, and what you should be purchasing for your spouse based on the associated material or stone! What is the theme for your next anniversary? Your anniversary is one of the most important days of the year - check out how to create a unique day of celebrations for your partner, and show your love for them. The first meeting between your partner and your parents can be a source for anxiety, but it need not be... you just need to find the perfect setting, and the conversation will be flowing! Dying to get married but your partner's still not taking the hint? Here are our tips to help you give them a push in the right direction and hopefully get a ring on your finger!